I had a fascinating and wide-ranging chat to Rom Harré over lunch on Thursday at the LSE. We started talking about bureaucracy and the inauthenticity of governance in educational institutions, and (what I took to be) the relationship between the social structural conditions for governance and the agency of those who are responsible for it. In a way, this set the scene for a broader discussion of teaching, learning, knowledge, positioning theory, music and language. We turned to education, where I gave a brief overview of my work, and my particular interest in Harré's 'Positioning Theory' and how it relates to teaching: the challenges of teaching, of the nature of knowledge, of knowledge's relationship to insight, and how these issues relate to the organisation of education. And, of course, the nature of language. This led to a consideration of Harré's relationship to Critical Realism. The reification of social categories within Critical Realism is a concern. Possibly because of their adherence to 'objective rationality', they seem to be less aware than one would wish of the role of language in making distinctions. I mentioned my discomfort with the utopianism of critical realism. I think we agreed that CR was an awkward mix of an innovative realist philosophy with a rather old-fashioned radicalism. The extent to which it is very difficult to critique the Critical Realist position with Critical Realists was something I discussed with reference to the role of personal identity with processes of social construction of knowledge. We had discussed earlier the importance of insight into the personal dimension of knowledge. Harré mentioned that he places particular emphasis on the teaching of biography of key thinkers. This does seem to be something missing from Critical Realism. Then we talked about music. I expressed how I thought music had a rhetorical nature, in that the musical 'acts' seem to serve to maintain a biological state of both the listener and often the performer. Schenker fascinates both of us, and the issue of the 'family resemblance' between a reduction of a piece and the original raises many questions which we didn't get an opportunity to explore. He's just co-authored a book on the psychology of music: this stuff seems timely! (http://www.amazon.co.uk/Psychology-Music-Siu-Lan-Tan/dp/product-description/1841698687) Sentences may work in a similar way to music, he remarked. I wonder if it's not so much sentences, but conversations which function in this way. The video is a way of exploring this. Following my previous post about the problems inherent in attributing behaviour (e.g. birdsong) to mental phenomena, there is something I want to explore further. Artistotle says in the Posteria Analytics that to know something is to know its cause. For him, that would mean to know its material nature, its form, the agency which brought it into being and its purpose. For Aristotle, cause is a real thing in the world. But this is not our modern understanding of cause, which largely we inherit from Hume. With Hume, cause is an idea, constructed through observation of regular successions of events. It is the regular succession of events of neuronal firings and bird tweetings which lead to the ascription of mental causation in this case. But getting back to Aristotle for a second, one of the things about the four causes is that although we might think of them providing the prior conditions for a things existence (that it has a material, a form, someone or something makes it, and it has a purpose), this prior-ness is something which we inherit from Hume. Some of the conditions for existence may only be understood through understanding the causal power of the thing in question. This is particularly true of a thing's purpose. It may also be true of the efficient cause (who makes it), and I wonder if it is true of the formal cause too. This is methodologically useful, because I think it is easier and more practical to study the causal power of a thing than to speculate on the prior conditions for its existence - be they neuronal firings or flapping butterflies. It also ties neatly into Stafford Beer's POSIWID principle: the purpose of a system is what it does. Understand what something does rather than speculating on antecedent (mental or otherwise) causes may be a more productive route for the study of birdsong and many other phenomena. I saw an interesting article on research that had been done to uncover the neural cause of bird song. The song could be attributed to a 'domino effect' of neural firings. Quite convincing... so why am I sceptical? I could just be being bloody minded in the face of strong evidence (heaven forbid! ), except that I think there is a philosophical error being made which says sonething like 'the music is in the bird's brain'. So I've been experimenting with Centipedes and motion detection! But I wonder about absence in the first place. Each human being, as such, possesses the requisite regulating mechanisms for maintaining viability in a remarkably wide range of environments. That some starve, or survive only a few weeks is not through any absence within. It is through trying to exist in particular hostile environments: war zones, drought-ridden landscapes, etc. And whilst some of those environments are physical (drought), more often than not the very presence of human life in those areas is the result of pathological social forms which destroy human life. Rather than defining poverty as absence, I would prefer to define it as 'blockage'. For the capacity to transform social pathologies rests in each one of us. That we continue to reproduce them is not from any absence, but because our agency to do so is blocked: usually by ourselves and our ideas of our abilities. Understanding blockages means understanding the relationship between reflexive processes and social transformation; between agency and social structure. And this is where education comes in. Education is about removing blockages. But we have traditionally seen higher education as an elite activity. The powers of 'unblocked' reflexive transformation of social forms as belonging to a few. But we no longer have a world where a division between the elite and the masses can be managed (and attempts to manage it like this always resulted in catastrophic conflict). We have a world deeply inter-connected, where connections are fashioned out of conflicting value positions, where the agency of each individual irrespective of their social position carries risks which have a bearing on everyone else. Maybe the only way to make such an inter-connected world work is to move towards a global understanding of the power of the individual. And such a global understanding of the power of the individual starts with the individual recognising their power and learning to use it effectively and responsibly. And this requires the removal of blockages. Higher education is not the only way to achieve this, but it might be the most effective. It works because it creates a context for critical free communication, unlike the everyday world where communications tend to be more constrained. This is particularly important in those parts of the world where any sort of personal freedom is highly constrained. Through free critique individuals can learn to unblock themselves (if they learn nothing about this, then higher education is not doing its job! ), and in becoming more unblocked (freer) as individuals they become (by my definition) less poor through being able to realise the power of the resources latent within them. So why is our current government intent on hitting those institutions that work to widen participation in education? Short term thinking about costs and benefits and consumer models of education are very dangerous. There is, frankly, a poverty of thought: government has its own blockages - a vestige of an elite education system. I worry that the costs to society and the world of not widening participation in education are far graver than the costs of providing it. What is Diachronic symmetry? We might see it in the way we tell historical narratives about something... In biology it would be a way of telling the ontogenetic story of an organisism, or the phylogenetic story of a species. In economics, it might be the emergence of relations of production. But diachronic symmetry is also something we feel. We feel it's time for change ("and now for something completely different! "), or we feel that something needs developing, or we feel that something simply has to be forced to happen. This symmetry of the flow of experience is genuinely diachronic. It's in the moment; not rational. Whereas narrative histories are constructs, emerging from the flow, they are in essence synchronic. I'm thinking about Bergson's 'cone' of memory and the distinction between the lived present (temps réel) at point S, and the constructed past as sections of the cone. 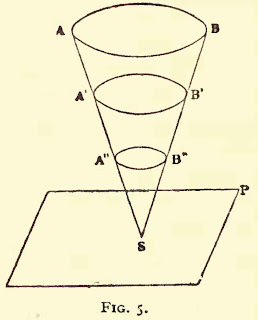 Diachronic proportion at point S, in the flow of lived experience however is causal in the construction of the cone and its sectioning through remembering processes. But Bergon's diagram does invite some speculation as to how the proportions and symmetries of lived experience might be shown. What's particularly interesting with Bergson is that he situates rationality with the conic sections, and not with temps réel. He's probably right. Having said that, however, rationality may be all we've got - particularly for organising social forms which seek to maintain the viability of human life. Bergson, like many thinkers of the period, takes an individualist standpoint when he thinks about memory and the forms of lived experience. Even if he was right, his structure of lived experience would lead to the emergence of social structures. Yet he doesn't go so far as to explore the sociological dimensions of his theory. If there is a form to diachronic experience (to temps réel) and its relationship to the synchronic aspects of perception (the cone of memory for example), how does this form relate to the synchronic structures of institutions? How does it relate to the diachronic processes of the emergence of social forms? In my thinking about symmetry and proportion, I was playing around with logarithmic spirals and the golden section proportions that sit behind them. This might provide a different way of presenting the regulating functions of the VSM rather than Beer's diagram. Basically, I'm concerned to show the relative proportion of the regulatory mechanisms, and the fact that at any point we may be 'damping' (disrupting), or coordinating (coercing) or dreaming (exhorting), and that these things will almost certainly not be in equal measure at any time point. We can think of this as a synchronic (structural) dimension of organisation and coordination. But there is also a temporal or diachronic dimension. Over time, interventions and communications are also in proportion. So the spiral becomes dimensioned. Does this give is a multi-dimensional way not just of analysing the regulating mechanisms over time, but also a way of intervening with them..? What sort of evidence is being produced for the efficacy of e-learning project interventions? How is the evidence interpreted? How is it gathered? What does it mean? In fact, is it evidence at all? One perspective, which I find interesting, is that what is touted as evidence is in fact narrative. Projects are 'participative story generators'. This is not to take anything away from much of the value of individual projects, but what is really produced are stories: some of them inspiring, some of them horrific (not enough of those! ), some of them a bit dull, etc. The inspiring stories may be causal factors in others trying to reproduce them; the horror stories may be causal factors in others trying to avoid the same mistakes (both of those are valuable in equal measure, I would say! ); the dull ones are.. just dull. Is making stories a worthwhile activity? Yes, but it might be argued that it would be just as effective to make them up. However, the technological aspects of the projects allow them to be participative, so that authorship is a shared experience, with different perspectives on the story distributed amongst stakeholders in the institution. This, I think, is particularly valuable. So why not celebrate stories and stop pretending that the value of particular interventions may be borne out by 'evidence'? One of the most fascinating aspects of fractal images is the extent to which they display similar proportionality to natural objects. In the Mandelbrot set, for example, we can see the golden-section ratios (Phi) clearly. At the moment, I'm wrestling with the idea of proportion and symmetry in learning and educational organisations. Often as teachers we instinctively know when to 'change the pace' or 'do something different'. Bartok's 'instinct' (and Debussy's too as Roy Howatt informs us) has a number, and it's the golden ratio. Fractals are pretty simple, and may be useful as 'symmetry generators' in some sort of simulation of organisations and learning. The question is, how might this be done, and what might it mean? I'm making progress on creating a 'flight simulator' for the University. The idea is to create an agent-based simulation which allows for the realistic modelling of the dynamics between diverse individuals and the social and material structures they inhabit. This would allow for the dry-running of interventions and observation of likely effects, which would in turn allow for deeper planning for mitigation for those effects. The simulation is based on proportionate balancing of different 'modes' of intervention: disruptions, exhortations and coercions. Management is a process in time, and perhaps the greatest challenge is to develop a feel for concurrent processes and trends and to move with them. I think this requires an understanding of the appropriateness and proportionality of an intervention in the context of what is judged to be going on at any particular moment, what the goal is, and how the deep structures of the organisation at any point are configured and may interact. With conventional management thinking, proportionality is a tricky concept: how are proportions to be judged against one another? In its place, we tend to find idealised notions of optimal organisation or managerial effectiveness. Whilst acknowledging that some of these ideas are very valuable (the Viable System Model is such an idealisation), I want to get away from ideals a bit and deal with the time-flow reality of management and intervention. At the back of my mind, I'm wondering where idealising organisations (and particularly universities) is leading us. The suggested savage cuts in university budgets, argued for on the grounds of optimal organisation and economic necessity, lie on this theoretical foundation. As with the monetarist experiment in the 80s, it may take catastrophic mistakes to reveal the deficiencies of existing theory. As in the 80s, it will not be particular institutions that cost society dear, but the values of government that lie behind the critique of their viability. Multiversities or Universities? Reflections on MacIntyre's "God, Philosophy, Universities"
MacIntyre's recent charting of the relationship between catholic thinking and universities provides a powerful platform for a deep critique of where we are now. Much in line with his thinking about ethics, he identifies an 'un-tethering' process which has led to the current obsession with specialisation and professionalisation, whilst losing sight of anything 'universal'. "Research universities in the early twenty-first century are wonderfully successful business corporations subsidized by tax exemptions and exhibiting all the acquisitive ambitions of such corporations"
"...the contemporary research university is, therefore, by an large a place in which certain questions go unasked or rather, if they are asked, it is only by individuals and in settings such that as few as possible hear them being asked." Isn't that ironic considering the technology we now have! Classroom patterns and online teaching: one teacher per class? I was thinking about the interview I did with Scott the other day. When we think of amplifying our teaching online, why do we think of one teacher talking to class or one teacher talking to camera? Is it because our face-to-face practice has led us to think of the 'efficiency' of teaching as being one-teacher-per-class? But online, this really doesn't make sense, since the scale of what might be achieved through teaching online is much greater than face-to-face. 5. it provides opportunities for different kinds of student interaction with the teacher group. I'm thinking about a 'wild' university, as opposed to the 'cultivated' (and genetically-engineered) variety that we are so familiar with. Following yesterdays thoughts about custodianship, the implications of a wild university are interesting. The value systems of governments which determine 'fairness', 'fitness', 'rigour', 'value for money' and whose value is transferred to students through qualification is a centrally-controlled value system which privileges normative value and truth-statements: "Joe bloggs is worthy of the award of a degree in Botany from Oxford"; "he is competent in botany". Why does Joe Bloggs need a qualification to make assertions about his ability at botany? The qualification is a warrant, making a statement about his botany ability a 'warranted assertion' (adequating). But does the warrant have to come from an institution? Could it come directly from other botanists? This might equate to the 'referential expressive' dimension of truth. Then there is the 'alethic' truth of Joe himself as a botanist in convincing others of his botany ability: maybe this is the 'tacit' botanist in him which other botanists may detect. He needs no institution to have that, although the institution may have helped him develop it. How could Joe's botany ability become normative? How could a statement about Joe's botany be trusted? Students as custodians of the University? With all the talk of tuition fees rising, I've been thinking about different ways of viewing the problem of the funding of education. In particular, I'm wondering about whether we have to see this through the lens of the 'benefits' of learning? What about the benefits of 'institutional membership' and participating in the maintenance of cultural institutions? Why not see students as shareholders in the institution for life reaping dividends (maybe in terms of rising social capital) for their 'investment' rather than purchasers of learning? It strikes me that universities have been around for 900 years because people have cared for them in the past. That care relationship is not something based on consumption, but rather on custodianship, and students have been the main custodians. If you pursue this membership model, what then becomes of academic quality and the 'degree awarding' role of the University? If my role in the University is to help take care of it, how does the taking care relate to the achievement of qualifications? These strike me as interesting questions! Scott Wilson and I made this video discussion yesterday to introduce Open Source Software to students. Introducing Open Source Software Development from Strategy Workshops on Vimeo. One thing is for sure -- she wants to do it again! I found Hermann Weyl's 'Symmetry' in the library, sought out via a circuitous route by way of Stafford Beer's 'radar' reading list and a fascinating discussion yesterday. It's beautiful. What's interesting is the two uses of the word 'symmetry' - one for proportion, the other for mathematical bilateral symmetry, and the way the two forms of usage relate. Symmetry and pattern are related. Musical forms have symmetry: typically A-B-A forms, but the second A is often not the same as the first. It happens at a different moment. I wonder if physical symmetry is also like this - happening at a different 'moment'; the moment when the pattern is first cognised, and the moment when it is re-cognised. What does symmetry tell us about ourselves? What does it tell us about the flow of our experience as we are geared to respond to it? But that the symmetry which has the most powerful effect on us is often imperfect. What are the regulating moments of playful experience that go on as we look at a sphere or a cube? Astrid and I spent much of today visiting my dad in a 'respite' home. He didn't really want us to leave - but we're powerless to do anything else. Despite the best efforts of the staff (some of whom were very caring), it was full of desperately confused people: "Do you know where I am?" came one somewhat existential refrain from a lady who continued to ask this question even if you attempted to answer it. "Who are you? I haven't seen you before!" came another. It was like being thrust into an Ionesco play. By the afternoon, the lady who didn't know where she was decided not only did she still not know where she was but that with equal determination she had to find "the end of the dining room". This obviously caused further confusion. Whatever anyone did contributed to the dynamic which led to the question being asked once more "is this the end of the dining room? ".